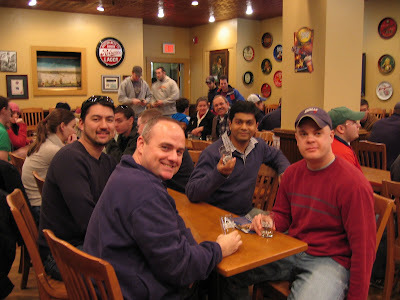 Check out these photos of "BigDog" Mike, Chris, Shridar and me when we took the Sam Adam's brewery tour a couple of months ago. One of the beers they let us taste was the Boysenberry Wheat, a LongShot winner from 2006, which was MUCH better on draft than it was from a bottle. 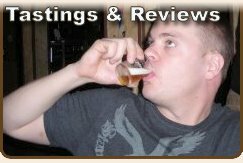 Sadly, I didn't write a review for this tasting. That's me and the guys having a toast over a few fresh glasses of Sam. The tasting room was standing room only at this point, but of course we had "front row seats" right by the bar. In fact the tour guide/bar tender snapped this photo. 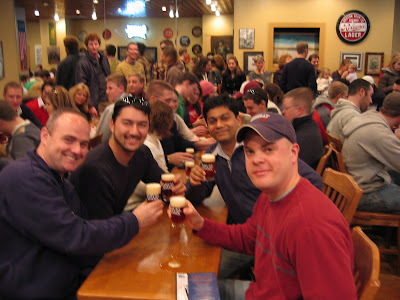 From left to right: Chris, "BigDog" Mike, Shridar, and me in the Sam Adams brewery tasting room. 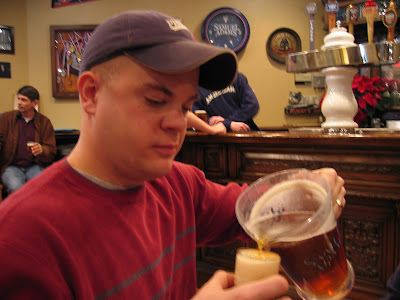 That's me and a sloppy pour, I was a little over eager to partake in the goodness. The brewery tour had my mouth watering. 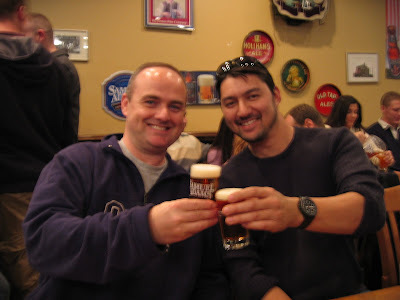 Mike and Chris toast over a couple glasses of fresh and delicious Sam Adams Boston Lager. 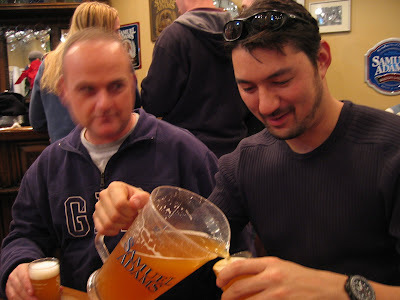 Me and two empty pitchers of Sam... That's the tour guide in the background, he has a great job! 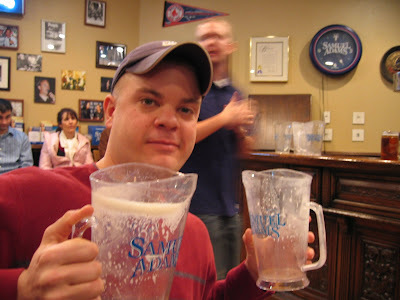 I'm planning on making another run up to the Sam Adam's brewery, followed by a jaunt across town to the Harpoon brewery. Two brewery tours in one day, with a great city full of great bars for afterwards. What could be better than that? Stay tuned!!! Looking for something new at the package store this weekend? Why not try the Sam Adams LongShot six-pack? Sam Adams released this special edition sixer featuring the winners from their 2006 Homebrew Contest. 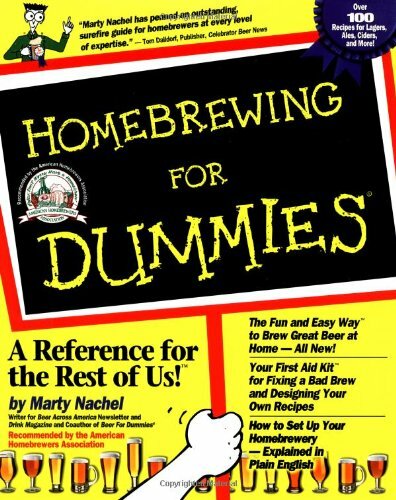 Jim Koch is really trying to bring the joy of Homebrewing into the mainstream, and he's giving the average joe the chance to get his or her own 15 minutes of beer making fame. The collection includes Old Ale by Don Oliver of California, a Dortmunder Export brewed by Bruce Stott from Massachusetts and a Boysenberry Wheat, submitted by Samuel Adams employee winner Ken Smith from Colorado. Don Oliver and Bruce Stott were selected out of more than 1,500 homebrewer contestants. I can't help but wonder how many out of that original 1,500, were just rotten beers. Much in the same way that American Idol has some real losers in the first few rounds... You think there were any Natural Lite quality beers in the early rounds of judging? "It was tough choosing the winners, but our panel of judges decided that the Old Ale and the Dortmunder Export stood apart from the rest in taste and adherence to style guidelines. As for Ken's Boysenberry Wheat, it is also truly exceptional," said Samuel Adams founder and brewer, Jim Koch. "I'll never forget the feeling I had when Samuel Adams Boston Lager was first sold on shelves nationwide, and I'm excited to share that experience with all three winners." Style Description from our friends at BeerAdvocate.com: Made popular in the 19th century in Dortmunder, Germany, these pale golden lagers exhibit a classic clean character with notes of biscuity malts. Bitterness is akin to a German Pilsner with an aromatic aroma. Mouthfeel is firm and even, with an overall dry tone. 1. Appearance - Sam's Dortmunder Export is a very inviting clear and golden beer with a light head. 3. Taste - In keeping with the baked goods theme, this beer literally tasted like home made bread, or perhaps cake. You can definately taste the malts as the beer moves from bitter to sweet. The overall flavor was a bit overpowering for me, too sweet, almost like the beer equivilant of a desert wine. 4. Mouthfeel - Course, medium in body. The carbonation was moderate to flat. Not overly satisfying. 5. Drinkability - Drinkable? Yes, but certainly not a favorite, it's the beer that tried too hard. Good for 1 or 2 at most. Style Description from our friends at BeerAdvocate.com: An Americanized version of a Hefe Weizen, these beers range within the pale to golden range in color. Reminiscent of a Hefe Weizen in appearance, unless filtered. Long-lasting head with a light to medium body, higher carbonation is proper. 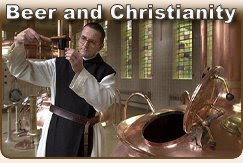 German Weizen flavors and aromas of banana esters and clove-like phenols will not be found. Most use a substantial percentage of wheat malt. Hop character will be low to high but most are moderate in bitterness. There may be some fruitiness from ale fermentation though most examples use of a fairly neutral ale yeast, resulting in a clean fermentation with little to no diacetyl. Often served with a lemon wedge (popularized by Americans), to either cut the wheat or yeast edge, which many either find to be a flavorful snap ... or an insult and something that damages the beer's taste and head retention. 1. Appearance - Sam's Boysenberry Wheat had an inviting golden bown color, with a cloudy or hazy quality. I was dissapointed with the moderate head, but that may have been due to my pouring technique. 3. Taste - This beer can best be described as a buttery boysenberry pancake in a bottle. The berry favoring was good, not overpowering, but any more would have been. Visions of berry muffins danced in my head. The beer's creator did a solid job of balancing the berry and fruity undertones with the beer's mild bitterness. 4. Mouthfeel - Creamy and toasty with a healthy amount of carbonation. Not heavy, but bordering on chewy, which goes hand in hand with my pancake and muffin analogies. 5. Drinkability - A drinkable beer, if you don't mind the berry undertones. I'd have more than one if it was being served, but this isn't something I'd drink on a regular basis. The novelty of the berry flavoring may get old. Drinkability Scale from 1- 10: A strong 6. 1. Appearance - Cloudy but inviting, complemented by a splendid head. 2. Smell - Sweet and fruity, with a delightful herbal quality. 3. Taste - Full flavored, bruity but exciting. Balanced with a taste of Spring in mind. 4. Mouthfeel - Chewy and fruity - fully balanced. 5. Drinkability - Very fruitfull! Style Description from our friends at BeerAdvocate.com: A Belgian Style ale that's very pale and cloudy in appearance due it being unfiltered and the high level of wheat, and sometimes oats, that's used in the mash. Always spiced, generally with coriander, orange peel and other odd ball spices or herbs in the back ground. The crispness and slight twang comes from the wheat and the lively level of carbonation. 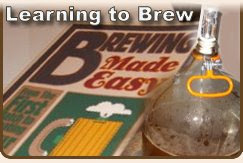 This is one style that many brewers in the US have taken a liking to and have done a very good job of staying to style. Sometimes served with a lemon, but if you truly want to enjoy the untainted subtleties of this style you'll ask for yours without one. 1. 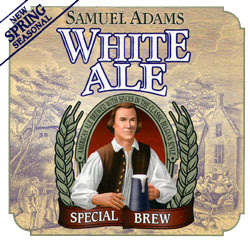 Appearance - Sam's White Ale had a very pleasant dark golden color, with a cloudy or hazy quality typical of the style. Pouring the beer from the bottle into a nice clean pint glass produced a moderate head, which didn't last long. More head would have been better. (Insert your own inappropriate head joke here...) Sam's White Ale had a fair amount of carbonation and an over all inviting appearance. 3. Taste - A very refreshing and satisfyling sweet flavor. A pleaseant and distinct taste that reminded me of butter. The beer goes from smooth to a light and toasty taste, featuring crisp citrus highlights and a slight twang in flavor. 4. Mouthfeel - A medium bodied beer that is light enough for a warm Spring day, but satisfying enough for any time of year. The level of carbonation gives the beer additional substance, yet remains light enough to refresh the drinker as it moves from a gentle creamy start to a crisp ending. 5. Drinkability - This is a very drinkable beer. Satisfying, but won't leave you bloated. The perfect treat for a hot Sping or Summer day in the back yard. Drinkability Scale from 1- 10: A solid 7! 1. Appearance - Sam's White Ale was robust, cloudy, alive and inviting. 2. Smell - Sweet and roasty with both herbal and fruity elements. 3. Taste - A good flavor, although, slightly bitter. 4. Mouthfeel - Not flat nor over carbonated, goes down like water. 5. Drinkability - Yes, I would have another, it's drinkable.